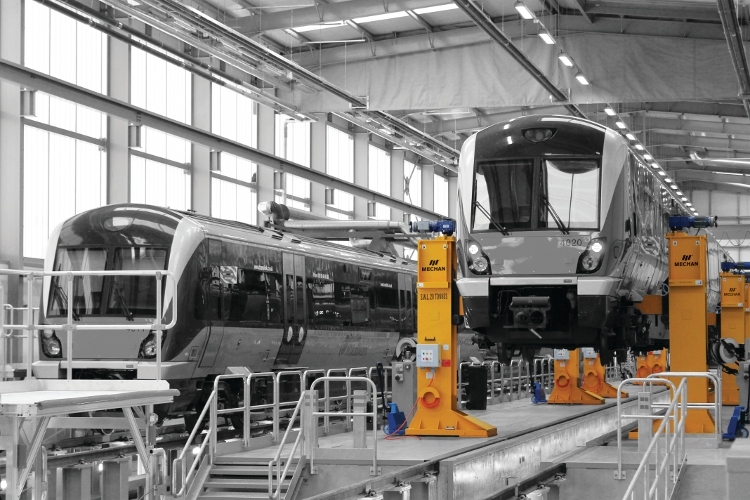 Translink commissioned our expert engineers to design, construct and install a range of equipment at its brand new, £28 million train maintenance facility in Belfast. The purpose built Adelaide depot is equipped with 12 of our flagship lifting jacks, along with two engine removal tables and two bogie turntables. They are being used to service the 20 Construcciones y Auxiliar de Ferrocarriles (CAF) Class 4000 trains, introduced to the local network to renew and expand its existing fleet. This latest order placed by Adelaide’s main contractor, Graham Construction, complements the lifting jacks and engine removal tables we installed at Translink’s York Road engineering facility in Belfast in 2002. Boosting capacity on Belfast’s rail network was the key to improving the services offered to customers, but as the existing local depots were at full stretch, this meant investing in a third facility. Adelaide exemplifies recent developments in depot maintenance, offering staff a safe, efficient environment in which to work, resulting in a faster turnaround and more reliable rail service.